No two ways about it: this is a weird release. If you expand the image above by clicking on it, you can see the etching I refer to on side four (no, I didn’t “play” it, I just flipped the second record over for the picture). Even outside the fact that it’s a 3-sided release on a format that can only be manufactured with even numbers of sides, this is a combination of two EPs that, in total runtime, would necessitate two records even if they weren’t split one on a record or were re-configured to maximize the space on each side of a record. Now, logistics aside, the release does make a kind of sense: Sap (often stylized as “SAP,” though this has always seemed weird to me) is thought of as an “acoustic” EP (though it isn’t entirely) and Jar of Flies is also a clean, subdued record in the Alice discography, with a fair bit of acoustic work in it as well. While We Die Young was also an extended play release, it was composed of tracks that appeared on their first album, Facelift, and was considered a promotional release anyway. That means that, in addition to the acoustic/relaxed sort of tone, we’re now compiling all the EPs Alice made. They are also kind of book-ends and transitional pieces for their work as a whole: SAP was released after the consistent intensities and relatively uniform sound of 1990’s Facelift, preceding the more varied and classic Dirt by only a few months, which only lead to Jar of Flies and finally the self-titled album (also known as “Tripod” thanks to the three-legged dog that graces the cover). That said, the EPs are placed in reverse chronological order as the gatefold cover above implies: the cover art for SAP is the back cover and Jar of Flies is on the front, with the LP side designations to match. So, while I would prefer to save the most familiar (and favourite) for last as a build up, Jar of Flies came first in my listening and so will come first here. Jar of Flies was, as I mentioned, considered an EP on its release in 1994–there’s even video of the band saying “Screw it, let’s just release an EP,” in the studio at the time. Despite that, the release runs over 30 minutes (albeit only just) and does contain 7 tracks, which is somewhat respectable–or was a few decades before its release, anyway. In the 80s it might have been termed a “mini album,” but that term never seemed to catch on, as it just seems like splitting heirs after the three major types (album, EP, single–mini-album being placed between the first two). Apparently, it was the first ever EP to reach #1 in the charts, as well as the first release to do so for Alice themselves. During my first foray into “creative writing” in college, I found myself saddled with the assignment to write about a song that I associated with an event, and to describe the event in question via the song I chose. I was a bit stuck: I don’t really listen to music in that way at all, having settled into albums for listening quite distinctly in high school, and even, to be honest, earlier as young as I was and owner of music, even before it was something I was passionate about. Still, I was left with the idea that Jar of Flies was the way to do it–arbitrarily (or maybe carefully) choosing a song from the release for the assignment. It ended up annoying my sensibilities too thoroughly and I dropped the class before ever really even beginning–let alone completing–the assignment, though. My experience with trying to tie Jar of Flies to my life, however, was indicative of how strong the mood of this release is. It opens with Mike Inez laying down a very thick bass line that has a weight that automatically drags the tone of the music–and the room–down to the proper emotional state for what is to come. Jerry Cantrell wails in on a talkbox to accent Inez, who continues to carry the song proper as Sean Kinney works his drums in with just a few light touches on the hi-hat before Inez’s bassline is worked in against a standing set of guitar licks to bring the song to its verses: Layne Staley begins each line with “Hey ah na na,” but it’s so thoroughly drained of energy that you don’t even get the feeling it’s strangely juxtaposed. Low energy notwithstanding, the notes are chosen and move, left with “na na” singing that is entirely other than what you would expect from such fare. Layne’s lyrics are typically dark: “What I see is unreal/I’ve written my own part/Eat of the apple so young/I’m crawling back to start.” The final effects Jerry works in on his guitar make it sound almost as if he is tapping out the notes against the surface of a liquid, hitting the right spots to make just the right noises and rippling just slightly as he taps against them. Inez is not always so prominent, but he really sets the tone, even as Layne’s hazily sharpened vocals and Cantrell’s noodling give it flavours of distinction. This is perhaps appropriate: he has a co-writing credit for the music on “Rotten Apple.” Inez is immediately less apparent on “Nutshell,” though, which could easily be a purely acoustic song, with Inez and Kinney now acting more as the accent and fill for the sound of the song, which is based on a relatively simple looping chord progression that lets Layne’s vocals take center stage: “And yet I fight this battle all alone/No one to cry to/No place to call home,” which is then followed by an electric lead from Cantrell that drives home the isolation, while Staley’s voice turns to subtle, bittersweet “Oohs.” The song, unlike many on the album, does not experience much in the way of change, but avoids wearing out its welcome quite easily. “I Stay Away” was a top ten single, and the accompanying video was a rather creative and dark stop motion number, based heavily on the same colour palette as the jacket art–greens, yellows and oranges: murky and swampy, but with the warmth of life, even if it isn’t necessarily cuddly life. Much like the effort involved in an animated video as compared to a performance one, the song itself stands out on the album. There’s a string section to really bring the chorus home: as Layne sings out the title and the strings of Matthew Weiss, Rebecca Clemons-Smith, April Acevez and Justine Foy climb to the heights of drama to maintain the momentum he builds and carry it that much higher. Kinney uses one of his more intricate beats for the song, while Inez gives the bottom end curves and bounce to keep the song hopping. Cantrell uses more squalls and distortion than blues, the other strings taking his usual placement. “No Excuses” is built on an unusual lollopping beat that makes full use of Kinney’s kit, while Inez is left again driving the song. Cantrell and Layne explicitly share vocal duties for the first time on this release, likely indicative of Cantrell’s role in writing the lyrics of the song, while he mostly uses very open, ringing chords primarily throughout the song until ripping into a bluesier solo that has a more standard placement in the song–again, probably a reflection of his differing role, vocally. “Whale and Wasp” was apparently released as a promotional single, which is kind of amazing. The song is instrumental, and an exception in the Alice catalogue for that. Cantrell begins it with wailing bends over a more subtle finger-picked melody, sounds reminiscent of the hook in the Smiths’ “How Soon Is Now?” but more aching and pained, even as the strings make their second clear appearance for a ray of warmth, albeit a tempered kind–though that bend returns immediately after their brief interlude to echo out into the distance and emphasize the open space of the song. The lead does move to a more complete melody line over the other instrumentation, again warmer but not yet truly warm–I’m tempted to call it a minor key, but my instincts are not a musical education and have no authority to make such a claim. “Don’t Follow” is the second track (after “No Excuses”) to be written exclusively by Jerry Cantrell (though he also wrote “Whale and Wasp,” these two include credits to him for the lyrics) and was the last single released after No Excuses” with was a number one. “Don’t Follow,” though, is one of the three pieces I will play if I’m alone and the mood strikes me. The guitars I have, though they are covered in dust without exception mostly, are almost always left tuned a half-step down so that I can pick them up and fumble my way through “Don’t Follow,” “Nutshell,” or “Desolate Ways” (an odd little guitar instrumental from Morbid Angel’s ex-second guitarist, Richard Brunelle). This marks the only occasion on the album that Jerry takes the focus of the vocals, finger-picking a simple pattern until the song shifts gears and the harmonica of David Atkinson comes in, carrying with it Mike Inez and Sean Kinney, who serve as introduction for the assertion of control by Layne, whose voice has a different tenor to Cantrell’s, even as they often harmonize in their music. Neither sings cheerful lyrics, but Staley sings with a more positive sort of energy, until it all fades back to the finger-picked guitar of Cantrell alone, who intones just “Say goodbye, don’t follow,” as the song ends. “Swing on This” is the odd song out on the release: the feel is indeed “swinging,” as Inez dances across the bass and the notion of “swing” doesn’t seem out of place at all, until Layne sings: “Let me be, I’m all right/Can’t you see I’m just fine?/Little skinny, okay, I’m asleep anyway,” and his known drug problems make the sentiment behind all that a little more unpleasant, and abundantly clear. Still, for all that the song is tonally in place, its more bouncy and cheerful melody–other than the chorus–feels a bit out of place in an otherwise rather somber, achingly beautiful release. Now–SAP. Perhaps you can see why I might have preferred this to run in the other direction: how do you follow Jar of Flies? While Jar is seven songs, SAP is really just four, plus one amusing track of intentional ridiculousness. Like Jar, SAP is somber and downcast, but more of the feeling of a small band playing on a back porch near a swamp–laidback and heavily acoustic, resembling more a jam-session than a deliberate studio recording, even if the production couldn’t be said to have suffered enough to imply a more live and haphazard recording environment. Like Facelift, SAP is largely the compositional work of Jerry Cantrell alone: he wrote the music for all four (normal) songs, and the lyrics for three of them. “Brother” and “Am I Inside,” the songs that begin and end the song have guest vocal accenting from Heart’s Ann Wilson to great effect–she brings something more to the voices of Layne and Jerry, a kind of power neither one of them can quite manage. Even as Jerry is the undercurrent to Layne’s tide, neither can manage what she can. “Got Me Wrong” sounds like a vehicle moving on oblong wheels, rumbling rapidly for a moment before pausing in the air to crash back down as it hits that long side. Of course, this is the song that most emphasizes the misnomer “acoustic EP,” as Jerry plays a very clearly distorted guitar as part of the backing for the song–even if the primary drive is an acoustic one. “Right Turn” is actually credited to “Alice Mudgarden,” a bit of a play on the appearances of Mudhoney’s Mark Arm and Soundgarden’s Chris Cornell, who contribute vocals to the song, which begins as a simple guitar, bass and vocal song. Chris enters after the verse and brings his more subdued vocals to the song, though he eventually makes his mark with some of the range and histrionics he was more known for in the 80s after Layne and Mark take their turns on verses, as the whole range of vocalists begins to sing together and in opposition, the song blurring into a chorus of voices all shouting to each other. “Am I Inside” is the most foreboding of songs, though it flattens out into a sort of disquieting calmness with a note just off enough to make you wary. Ann’s second run at vocals bring a distant echo to Layne’s cry of, “Black is how I feel/So this is how it feels to be free” Which ends with a question, and then an empty space to emphasize how hollow the realization is. When the bongos (!) come in, Ann becomes more soulful in her approach to the vocals, as the song itself seems to almost cheer up before circling back to darkness. “Love Song Take 1” is the comment made by (most likely) Sean Kinney as his song begins, hidden and unmentioned on both CD and vinyl releases: it’s an intentionally weird and amusing mishmash of discordant sounds and off-kilter piano, megaphone vocals, faux-flatulence (yes, really!) and instruments that sound as if they might be being played with elbows or other inaccurate body parts, followed by pounding on the drums and piano in unison. It’s a weird end to the whole set, and was always a weird ending to even SAP alone. When he begins shouting “Rae Dawn Chong” and “kiss the midget,” you know something has gone wrong. Or right? I don’t know what to make of the release as a whole, even as all the songs on it are excellent: It feels like a pretty lame attempt to rush out the idea of a double record, with Jar of Flies balanced very strangely on its respective record, not split remotely evenly, only two tracks appearing on side two. Sap works out fine as a single record, but the set just seems a bit off and careless in its construction. Still, I’m not going to complain. 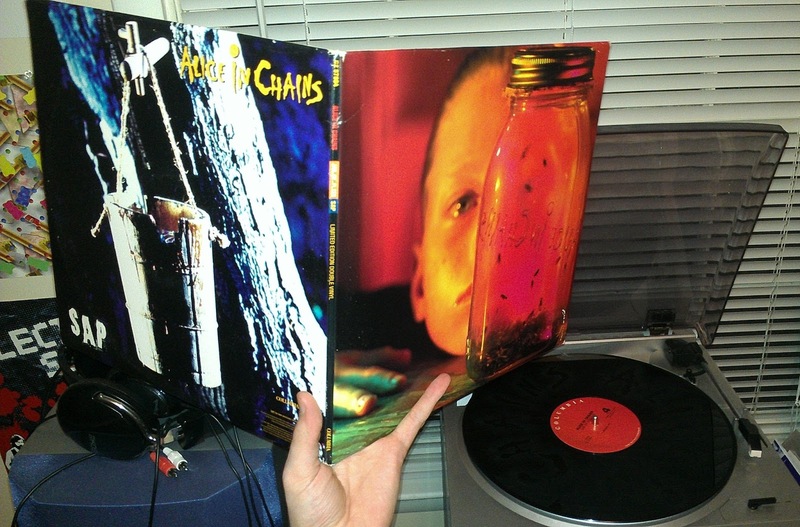 I’ve got Jar of Flies on vinyl now, after all. Copies are available at Discogs, including some on the orange/blue coloured vinyl with a slightly altered etching on Side 4. Next Up: Aphex Twin – ?